One thing I've learned over the past month: there are a whole lot of different people in this world with very different opinions. Which means while half of my "just Jessie B." friends will swoon over another breakfast casserole using a dozen delicious eggs, the other half will be pleading for something egg-free. Ha! Okay, so maybe not exactly 50-50... but my point is: there are a lot of folks here, and all with different tastebuds. Which is A-Okay by me. Because depending on my mood, I can go both of those ways too! So that just means I'll be doing more of BOTH. Getting my egg casserole on with all my favorite flavor combos (keep your eye out for an enchilada inspired version soon!) But also kicking the eggs to the curb sometimes & opting for somethin' different. Because whether you're an egg person or not, it's always good to switch things up! Another hot topic has been sweet vs. savory breakfast options. There seems to be a split in opinion on this one too- and I have to say I totally get it. Sometimes you're in the mood for sausage gravy, other times you're in the mood for something like my Baked Apple Cinnamon N'Oatmeal. Both are totally okay, but the latter isn't always Whole30 compliant. So I'm here with my best go at both ends: savory bowls today with sausage gravy, and sweet bowls with apples & cinnamon coming soon! 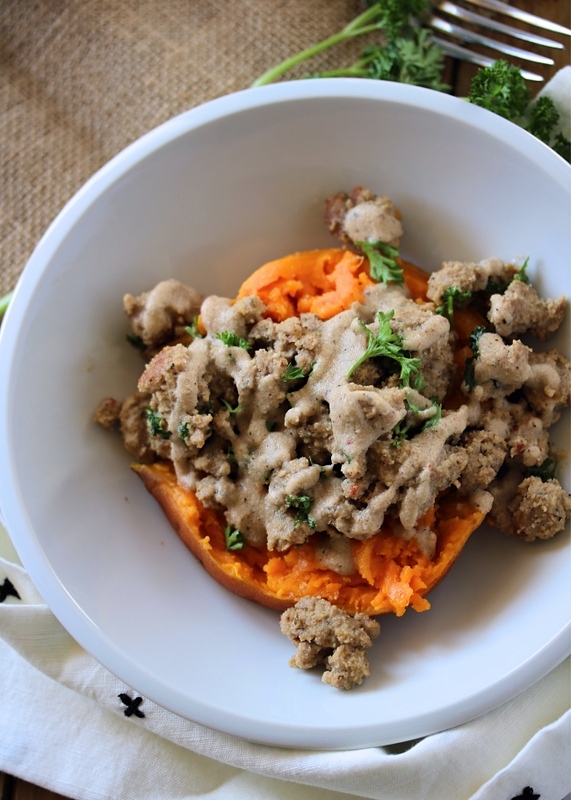 This one ended up being our favorite, because really: how can you say no to sausage gravy!? If you're one of my "biscuits & gravy" lovers, this is for you! 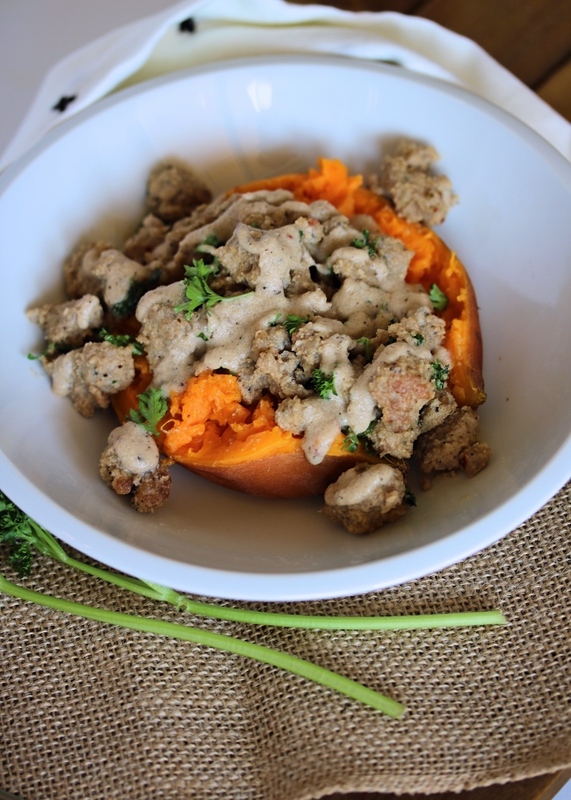 You can go all out and make Paleo biscuits with sausage gravy like I do in this post here, or you can stick with a sweet potato & make it Whole30 compliant. All I can say is sausage gravy tastes dang good- I don't care what you serve it over! I usually make it with coconut milk & coconut flour, but also figured out how to get it done with almond milk/flour! So be sure to read on to my "Notes" section for the details on that. 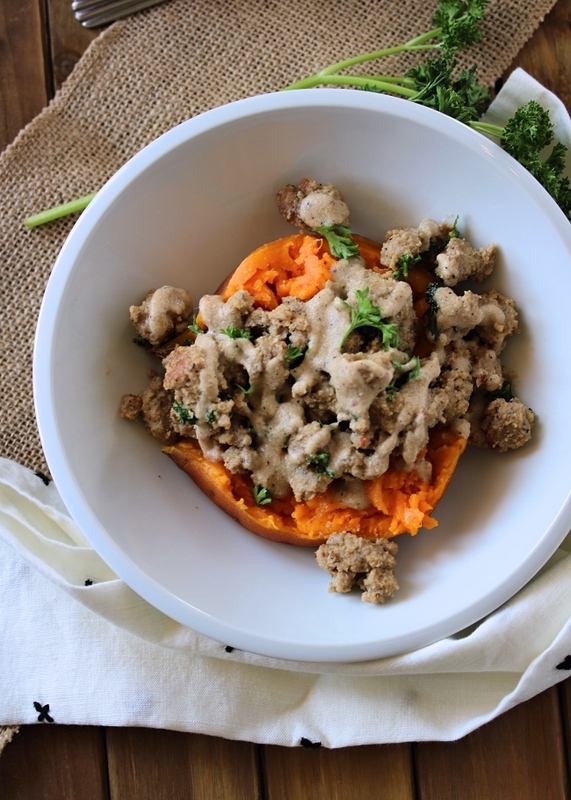 And these sweet potatoes? Oh. my. goodness. They are the best I've ever had when done in the Instant Pot! It gives them an amazing texture & brings out all of the flavors you love. (And did I mention so quick & easy!?) So, so good. I hope you all enjoy these bowls- and stay tuned for the sweet version coming soon! Makes 4 sweet potato bowls. Place a steaming basket or rack in the Instant Pot and add water. Scrub the sweet potatoes until skins are clean, and place them on top of the steaming rack. Cover and place vent on the lid to "sealing". Set on "steam" program and set the time for 10 minutes. When finished, allow the pressure to reduce naturally (can take up to 25 minutes). Brown the sausage in a skillet over medium heat until crumbled & no longer pink. Transfer the sausage to a separate plate or bowl, leaving the rendered fat in the pan. Leave your skillet on medium heat, and add the flour to the fat. Mix with a wooden spoon until it thickens to a paste texture. Add the milk a little at a time, whisking as you pour. Continue whisking as it bubbles & thickens to your liking (this takes longer for the almond milk version). Once it reaches the thickness you prefer, add salt & plenty of black pepper. Stir the cooked sausage in, and heat through. 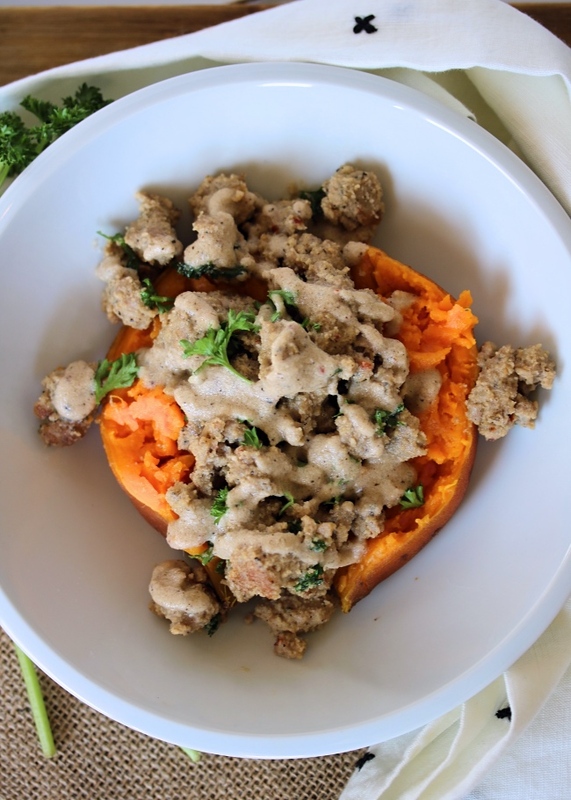 Serve hot, scooped over cooked sweet potatoes. 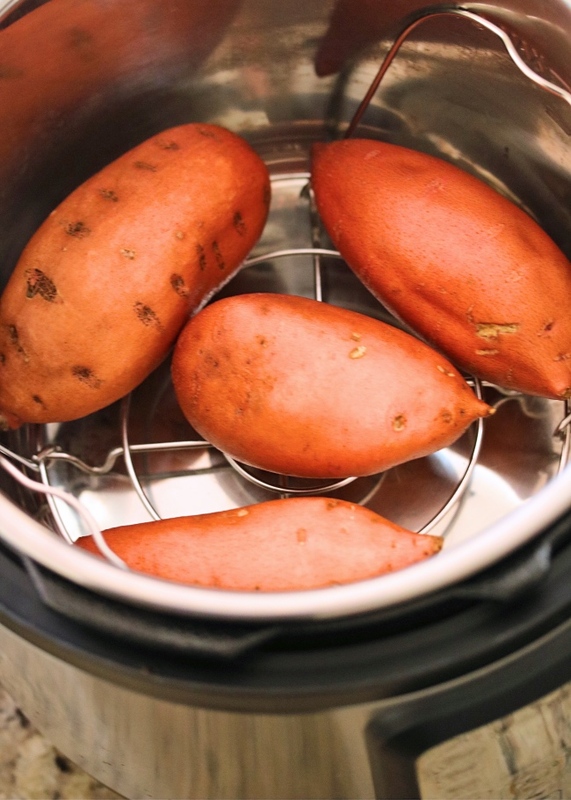 If you don't have an Instant Pot, you can steam the potatoes or bake them in the oven! I'm looking forward to incorporating this one into my last few days and start of my reintroduction week.